DiMarzio® has taken the traditional guitar strap design to a new level by creating straps with higher quality elements. 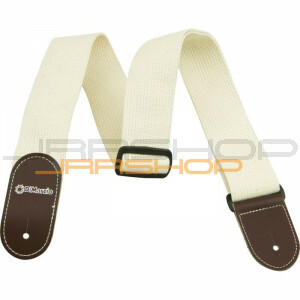 This strap is made of high quality woven cotton. The strap ends incorporate saddle stitching into the leather lozenge-shaped end pieces producing a stronger more attractive look. They also include a leather tie-cord for use on an acoustic guitar. The length adjusts from 32 to 561/2 inches (81  144 cm).